Hello everyone, Welcome to the month long STAMPtember party by Simon Says Stamp. STAMPtember® (st mp-t m b r) is defined by Simon Says Stamp in this way… an event intended to inspire, educate, and celebrate the greatness of rubber stamping. Simon Says Stamp was founded in 2002 with an interest in exclusively selling rubber stamps. However, it didn’t take long until we became a One Stop Shop. Now STAMPtember is so much more than stamps! This year you’ll also see a focus on many other exciting products like dies, inks, notecards and some special surprises. Our intention is to enhance your stamping experience! Rubber stamps still remain the heart of our business, and we are celebrating by releasing exclusive products with many of the industry’s finest brands. Be sure to visit our Blog as the home base for the festivities! Trust me when I tell you that the excitement this year is over the TOP, and we are planning fun surprises to keep you on your toes all month long! I love collaboration. I think it brings the best creativity. I am excited to share the stamp set and die Simon Says Stamp has brought out in collaboration with Pretty Pink Posh. Woohoo! It is the very first stamp set by Pretty Pink Posh. I am so happy for Paulina and a huge congratulations to her. Here is the photo of the Pretty Pink Posh stamp set and die. Absolutely adorable don’t you think? I love it. Here is the link to the stamp set at Simon Says Stamp store. Here is a sneak peek of projects that my colleagues have made. These critter are so versatile that they can be used with Pretty Pink Posh’s dies. Here is an example of how they can be used. I cannot wait to receive them and play with them. Yes, my set is still in transit. So I do not have a project using this new stamp set and die but I do have a card using Pretty Pink Posh and Simon Says Stamp older products. So bear with me. I will share my card using this new set as soon as it arrives. Here is first Christmas card for this year 2015 using Pretty Pink Posh dies, sequins and Simon Says Stamp dies and stamp set. I have used Pretty Pink Posh’s Stitched Duo 3 dies to die cut the window out of the tag in the die set. Then I die cut the window awning using the curved tag die from Stitched Duo 3 die set and Stitched Borders 3 die set. I sponged blue distress ink on the awnings. Then masked the white cardstock to sponge Mustard Seed distress ink. I then adhered the window tag suing foam adhesives on top of the sponged yellow ink. I stamped the sentiment from Simon Says Stamp Holiday Hellos stamp set on the awning. Then adhered the awning on the window using foam again to give the dimension. Love the stitched details on the die cuts. 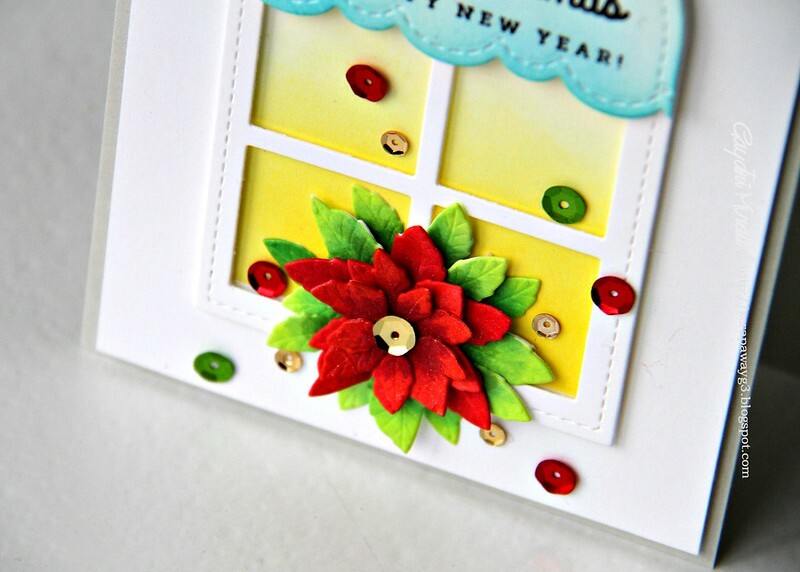 The poinsettia is from Simon Says Stamp Poinsettia Parade die which I die cut, coloured with copics and layered glued them. I then brushed the flower with Wink of Stella shimmer pen. Finally embellished the card with Traditional Christmas sequins mix from Pretty Pink Posh and gold twine to tie a bow on top of the card. Pretty Pink Posh designers are showcasing the new stamp set and die on their blog. Here is the list of all the designers. Make sure you visit all of them and leave comments. And also Simon Says Stamp Blog for more festivities. Thanks for stopping by my blog today to share the excitement! Beautiful Christmas card, Gayatri!! love it!! Hope your stamp set arrives soon 🙂 Can't wait to see what you create! Your card is absolutely gorgeous! I like the window with the awning where you can put a sentiment and the poinsettia is beautiful. I love the beautiful poinsettia and gorgeous background. A fabulous card. What a welcoming sight – light in the window. Very pretty. Love your use of the die cut for a window. Very pretty card. Now this is the perfect Christmas card. Like the awning on you window. Oh Gayatri, this card is beautiful! I will be watching for your card with the new products once you post it! Can't wait as they look like awesome sets! I can hardly wait to see what you do with the Hot Air Balloon set when you get it…'til then, I'm loving your Christmas card! Love the hot air ballon and the poinsettia! That is too bad you didn't receive you set yet, I really hope you will post a project when you do receive the set as I love your cards. Your Christmas card is just amazing, I love all the detail you have included along with all the layering. Can't wait to see how you use the new set, but in the meantime, what a fabulous card to start off your Christmas cardmaking season! First timer! Love your work!!! Keep it up!!! love the cards. My fave is the hot air balloon card. Beautiful Christmas card…who wouldn't love to get that in the mail??? Hope you get your stuff soon, waiting for another fabulous card…no pressure…LOL. What a clever way to use the die! Love it! This card is absolutely gorgeous! I do hope you will show us something when you get the stamp set as I plan to order it. Another adorable card using PPP. OMG!! What an adorable Christmas card!! Love your take on this Christmas card. The unconventional colors are alluring. Absolutely beautiful Christmas Card. I must buy this die set. how creative. great use to stretch your dies. Wonderful card Gayatri….love all the detail!! This is fabulous!!! I love how you stretched the dies on this!! I love it! Pretty pink posh is awesome! Your card is so pretty. Thanks for sharing. What a pretty holiday scene Gayatri, this is wonderful!! Beautiful Christmas card. I like the use of the window or awning for a die in the sequence make it very festive. Enjoyed looking at your cards. Pretty. Love this card!!! I love the Stitched Duo 3 dies!!! Hope your new set arrives soon!!!! What a cute Christmas card. Love the way the poinsettia stands out! What a lovely Christmas card! Great job!!! Such fabulous coloring with festive creation! You always inspired me a lot! Love always! Gayatri, this card has me wanting to play with Christmas stamps! Love this sweet card and your attention to detail- from the sparkle, to the bow, to the distressing you did on the window awning. Very nice card. I love it! Thanks for sharing. LOVE the design, such BEAUTIFUL inking and SWEET scene, PERFECT for sending Christmas CHEER – LOVE IT ALL!!! Gorgeous card! Can't wait to see what you create with the new set! suuper cute and so sweet card, I lvoe the new dies! Such an adorable card and love all the details! 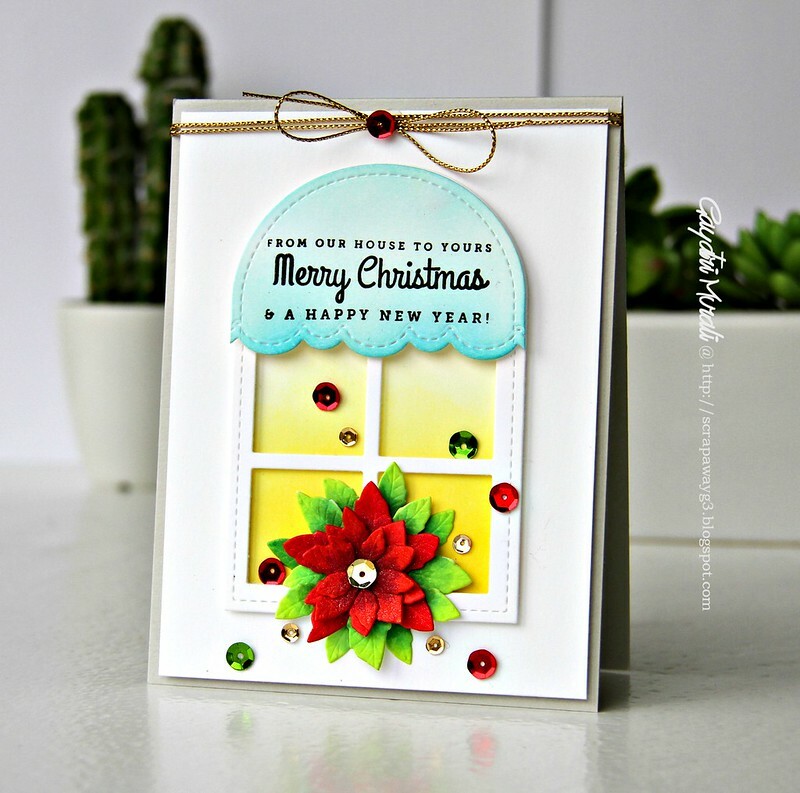 What a beautiful card- I love the poinsettia placed over the window… And yes, you've inspired me to get started on my Christmas cards! So beautiful! Love the window view! Beautiful card! I love the bright Christmas theme! Beautiful card!!!! Love the window!!! Beautiful Christmas card to jumpstart the season of mass producing cards…for some of us. Bummed you didn't get Paulina's set yet but will give us something to watch for later. Off to continue hopping! What a beautiful card! TFS!